IT ALL COMES DOWN TO THIS: Who will reign supreme, the Dog or the Cat?? This is the battle we’ve all been waiting for. 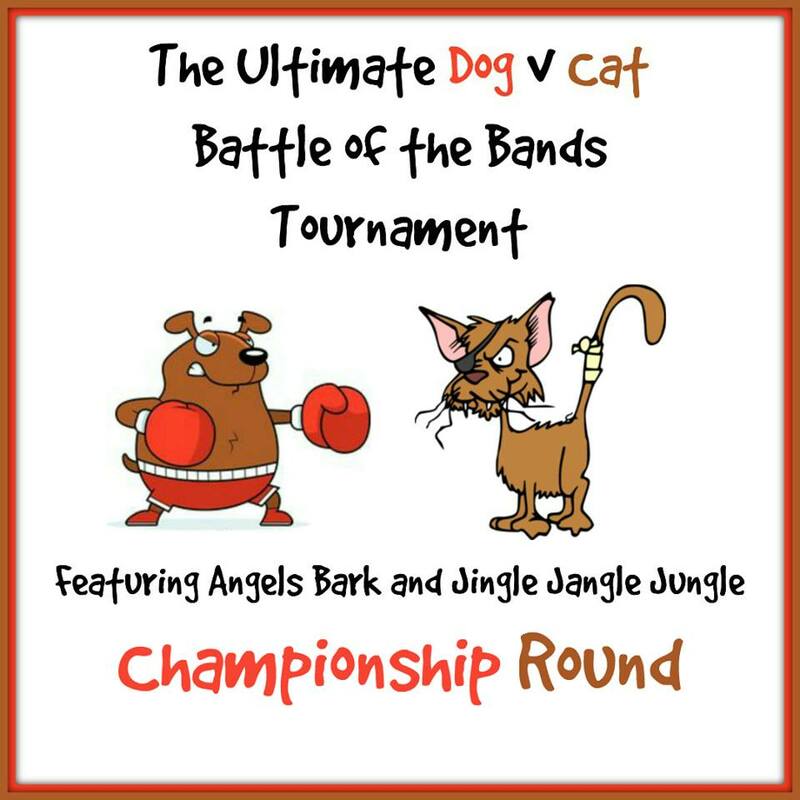 To recap: My friend Mary (from Jingle Jangle Jungle) and I teamed up on putting together this fun Dog v Cat Battle of the Bands Tournament. It’s been so much fun and hopefully you’ve had a chance to check it out. But if not, no worries! You can still play in this very exciting AND HISTORICAL event! After weeks of battles choosing best Dog songs and best Cat songs in the categories of Hard and Soft Rock, we had Playoffs to determine which song was going to Represent going into the Championship Battle. And now we are here with the exciting finish. Last month’s mid-month battle of the bands was the Final Playoff to choose the Dog song going into the Superbowl of Championship Battles. And at Mary’s place (Jingle Jangle Jungle) was the Playoff to choose the Cat song to send to this Grand Finale. Here voters had an opportunity to vote for either the hard-rock Led Zeppelin’s “Black Dog” or the soulful soft pop by Marvin Gaye, “I’ll Be Doggone”. It was a super tight race and tied all the way up to the very end, when two votes came in, pushing Led Zeppelin over the finish line. The final playoff tally was 8-6. (FYI: I voted for Marvin Gaye’s song). So the NDC (National Dog Conference) is sending hard rock winner “BLACK DOG” to today’s big Battle Championship! So just what Cat song is our Dog champ going up against? Mary’s NCC (National Cat Conference) Playoff winner is the beloved “CATS IN THE CRADLE” by Harry Chapin. SO THIS IS IT! It’s time for the knock-down drag-out battle between CANINE and FELINE. 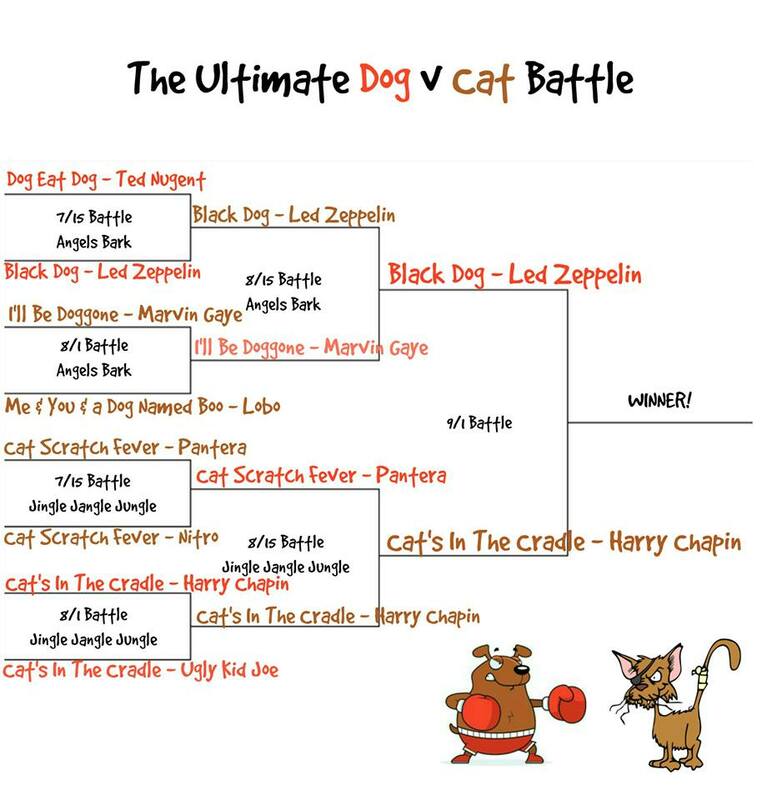 Who will be the reigning victor of the first ever DOG v CAT BATTLE OF THE BANDS TOURNAMENT CHAMPIONSHIP?? It’s in your hands People! Are you a dog person or a cat person? LET’S HEAR FROM YOU!!! And now, without further ado, Let’s Battle! VOTING WILL BE OPEN THROUGH SEPTEMBER 10th! And Don’t Forget to visit the other Battles today. First go to Mary’s Jingle Jangle Jungle Dog v Cat Championship battle post and place your vote there. There are links to all participants at BOTB Host Stephen McCarthy. This entry was posted in Stories and tagged Battle of the Bands, Black Dog, BOTB, cats, Cats in the Cradle, CHAMPIONSHIP BATTLE, dog vs cat, dogs, Harry Chapin, Led Zeppelin, music, The Ultimate Dog vs Cat Battle of the Bands Tournament by greyzoned/angelsbark. Bookmark the permalink. It has been both an honor and a pleasure working this tournament with you! Such a brilliant idea! Do you take secret ballots? I’m almost scared to cast my vote… good thing I don’t have cats in real life, or I’ll be covered in bandages after this vote! I really dig Harry Chapin, and Cat’s in the Cradle is a favorite.. but my loyalty is with Black Dog. I feel a closer connection to that one and Oh my goodness – the thought of turning my back on those poor little kitties is gonna hurt. So yeah… I’m gonna vote for Led Zeppelin, just don’t tell those little lovable furballs with nails. Did I tell you I once had a cat named Henry? Technically, he belonged to my ex-husband. His full name was Henry Porter Weinhard (someone enjoyed their beverages!) Henry didn’t ever think he was a cat. And spoiled he was! He demanded his litter box be cleaned before and after EVERY use. And We didn’t need an alarm clock as he would run his paws up and down the window blinds to wake us up. Look at you, first one in! Wellll, I was gonna say “Sure, I’ll take secret ballots!” but you kinda blew that one. 🙂 I must say, I am very surprised that you voted for the dogs on this one! Well, maybe not. And A big huge THANK YOU for all your outstanding work on all the tournament graphics and charts! They are fabulous and I’m very grateful to you for creating them. talk soon my battle teammate! Well, I’ll be doggone, it was nice of you to cast your vote for Marvin Gaye in a lost cause, and while I wish Marvin would have advanced to the final round, I have no difficulty supporting the NDC’s candidate Led Zep. I admired and respected Harry Chapin and feel badly about his tragic early demise, but I do not enjoy listening to his songs. They are much too serious, sad and depressing, and they bring me down, especially the Cat party’s nominee “Cat’s In The Cradle.” When I turn music on, I want it to turn me on, and hard rock does the trick. In my book “Black Dog” wins by a landslide. Led Zeppelin gets my vote. Thank you very much, dear friend Michele, and have a super weekend! And honestly, I’m not even sure who I’m voting for yet. Yeah, really! Oh my goodness…These are two great songs and I’ll be thinking long and hard. I’m giving the Championship a 10 day window for voting instead of the usual 7. I’ll keep you posted. Hey, did you get my note on my 4M post (beverage one) in response to your fabulous wine contributions? I haven’t been back over there yet but wanted to say Thanks again for that! There are some other good contributions in the comments too. That’s one theme that could go on and on and on I think! Hiya. I’m here tallying votes. Was going to do that yesterday but something dark brown started pouring out of the bottom of my truck. I noticed some ick on the driveway yesterday but didn’t know if that was a new or an old leak. Then I double-parked in my Mom’s parking lot just for a few minutes and when I moved my truck there was a significant puddle. I left my truck running in the parking space while I ran in to get something from Mom’s apartment and when I came out, the liquid was just pouring out. I have already spent a boatload of $$ getting oil leaks repaired (cam seal job, valves, etc) and now another one springs?! My neighbor who works on his cars all the time came over last night and confirmed that it is indeed oil, looks to be coming from the top (maybe a gasket?). Anyway, I have to take it to the shop… after just picking my Mom’s car up yesterday from the dealership garage. Good Lord! Anyway, I’m tallying Angels Bark’s votes now and Mary has already tallied hers I believe and then we’re going to get our heads together and come up with the final winner. I hear drum-rolls off in the distance…. Hey Jill! Good to see you here! Thanks so much for coming by to vote. Your support of the Dogs is sure appreciated. If you go over to Mary’s place (see link above) the battle is leaning toward the Cats… Yikes! P.S. I’m not doing a battle today so you might want to remove my link. Sorry, no time! Seems like I did this same Battle last night–I guess I did over at Mary’s. I’m going to stay consistent and vote the way I did at her site. My vote goes to Harry Chapin. His song has such an important message and it’s easily to listen to. Zep is great, but in this showdown Chapin is my preference. Hi Lee. Thanks for your vote. I’m tallying Angels Bark’s votes now and later today Mary and I will get together on the final results. Thanks for your vote in this all-important championship round! Zep all the way for me. Sad that Marvin didn’t make it but I can’t stand Cats in the Cradle. Happy Saturday! Hey Janet! Thanks for voting for the canines! It’s definitely a nail-biter. I”m tallying Angels Bark’s votes and Mary & I will get together later today to announce the ultimate winner. I have a feeling it’s going to the Cats….from the way it looks over at Mary’s site… Well, here too. There are several Cats in the Cradle voters here too…. MICHELE, you and Mary really rocked BOTB with this tournament idea. It was done once before but nowhere near to the degree and extent that you two did it. I thought it was very creative and great fun, and I hope you two will be doing it again in the future. However, this was a wonderful concept excellently executed, and my Stetson’s off to both of you for the ultimate BOTB tournament! Mary and I are getting together later today to determine the ultimate winner. I’m tallying Angels Bark’s votes now. So glad to know that your behind the canines, even though you voted for the felines…. Black Dog gets my vote! Thanks for your vote. Don’t worry, Mary and I are removing the duplicates so your vote counts and I’m including your vote for Harry Chapin in the Angels Bark total. Mary will have her total and then we’ll combine (removing the duplicates) to get the overall winner. We’re doing that later today so look for a post sometime this evening…. I thought Mary said if I voted over it would be void. Hmmm, maybe she was just pulling everyone’s leg and I fell for it. 🙂 I could’ve made that up, though. I’m awful about doing that sort of thing. You know making stuff up. No worries about not joining in on the dance floor. You’re welcome to do so anytime. I’ve been quite busy trying to keep things going while everyone is getting fixed up. lol I’m happy that I can this small little thing for Marie. 4M is her little baby and it means so much to her. Dogs all the way for me. I can’t help but see a visual of poor Harry Chapin singing this song while Led Zeppelin steamrolls right over the poor lad while they sing their song in full on raunch, musicality to the extreme and a guitar that won’t quit. Interesting visual Birgit! Tallying the Angels Bark’s votes now. Mary and I are getting together later on today to determine the ultimate championship winner. Will be interesting, this outcome. It’s a nail-biter for sure! As the crazy cat lady that I am I definitely have to vote for the felines today. Apart from that I do really love Harry Chapin’s voice and the message in this song. Great idea for a battle Michele, loving the rivalry. Hope you’re having a lovely week. Hey Pamela! So nice to see you here. I soooo owe you a visit over at your place. My God, life has been insane lately and I’m having a real hard time keeping up with it! I’ll stop over today and say Hey. I miss ya! I need to get caught up on what I consider to be the most beautiful love of all time! I love getting a glimpse into the life and adventures of a couple so well-suited. talk soon. Thanks for your vote. This battle is really close, at least here at Angels Bark. Mary and I will be getting together later today to tally up the collective votes and determine the ultimate winner of this Dog v Cat battle. I hate to be this way, but I like neither song all that well. I like Harry Chapin a little better than Led Zeppelin (their music always left me cold, to be honest), so I’ll go with Harry, I guess. Okay, a cold vote for Harry it shall be. Thanks John! The ultimate winner will be determined later today after Mary and I chat. I have a feeling the cats will come out on top with this one…. Led Zeppelin all the way! Thanks Leah! Another vote for the dogs…. We’ll have all the votes tallied and will be announcing the ultimate winner later today. Don’t be surprised if the cats come out on top though: Mary has a lot of cat voters over at her place…. Looking forward to seeing you and having Ham and Poppy join us on Thursday! Both songs bring back amazingly wonderful memories. But without a doubt, “Black Dog” is THE song, and Zeppelin is THE band. We are tallying the totals and will announce the ultimate winner later today. Thanks so much for your support and for your vote! I’m voting for Black Dog. Love both songs but Led Zeppelin is one of my all time favorite bands. Thanks Gracie! So appreciate your support of the Dogs with your vote for Led Zeppelin! Will be tallying the votes from Angels Bark and from Mary’s blog and then we’ll be declaring the ultimate winner later today. I’ll post the results by this evening. It’s a nail-biter…at least over here it is….